It was Shakespeare that placed the romantic couple of Romeo Montague and his hopeful bride-to-be Juliet Capulet in the quaint town of Verona, and for a very good reason. The town has always been recognized as the ideal romantic spot that provides the perfect backdrop for family feuds and fatal drama. Since long before Shakespeare’s time, romance and drama has remained two of the hallmarks of the city. It was back in 300 BC when the town of Verona became a center for commerce and trade. For nearly 2000 years, the Roman grand amphitheater and the ancient gates have stood as testament to the Roman rule, being built in the first century A.D. Over the course of the next millennium, there was a lot of tragedy in Verona, Italy. Mastino della Scala, also known as Scaligeri, lost a bid for re-election to rule Verona back in 1262. It was then that he took over control of the city with absolute rule that lasted until his murder. After his rule his sons took to fratricidal rage in an effort to take control of the town. It is no wonder that Shakespeare penned his tragedy in this town. 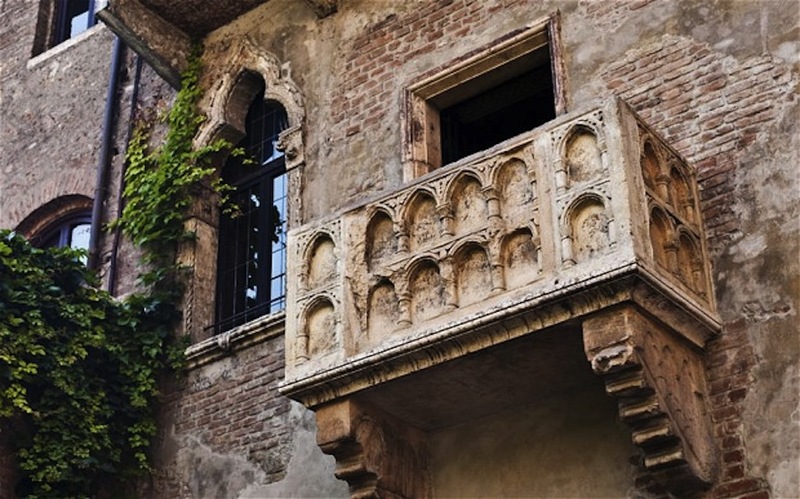 Even though Romeo and Juliet were fictional characters, Juliet’s balcony survives. This lovely stone balcony was first designed and built in the 14th century. It is home to Juliet’s statue which is available for free for public viewing. If the romantic icon of Rome is the Trevi Fountain, and a gondola ride in Venice, surely the Roman arena is the easiest place to fall in love in Verona, Italy. Spending a balmy evening gazing at the star-filled sky offers a romantic setting unlike anywhere else on earth. The Roman amphitheater, built in the first century is now the host to onstage theatrics along with summer ballets and operas that can be viewed from the steep stone steps of this nearly 2000-year-old structure. 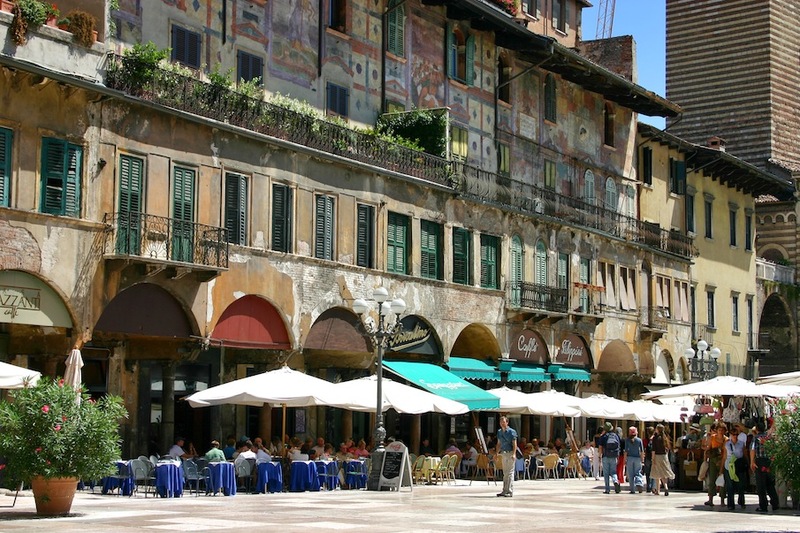 This beautiful piazza was originally the forum back in the days when Verona was ruled by the Roman Empire. Although historically no one knows for sure, it is likely the oldest ongoing shopping center on earth. Its main reason for remaining unchanged. The piazza is filled with goods and gossip. Only the items for sale have changed, from the herbs that were once sold in the marketplace during the Middle Ages to snow globes, small statues, and every other type of trinkets related to Romeo and Juliet. During the early hours of the morning, the residents of Verona ,Italy make their way to the piazza to do their shopping, long before the tourists arrive. This iconic tower rises high above the city and provides a spectacular view of the surrounding area. It is the easiest way to view the peach-marble façades and the red, Italian tiled roofs. In addition, visitors can see the Adige River along with an impressive sight of the Verona city walls. There are numerous available accommodations in Verona Italy. For anyone spending a holiday in Verona, there are expensive three and four-star accommodations. Additionally, there are apartments in Verona that offer an affordable solution that provides a high level of romance for couples in love. These apartments in Verona offer comfortable, quiet accommodations that are elegant in design. The moment anyone on vacation in Verona arrives in town they instantly get what makes this medieval center an enjoyable place to visit for a day, a week or even more.